For fashion lovers it’s always the same question every time… What’s next? And why not, the latest influx of changing fashion trends really tend to trigger the inner curiosity to know more and more of what the new flavors of styles are. For this, the ultimate source guide is the updated trend report coming out hot from the runway catwalks where every passing day has something new to add to the trend list. Focusing on a single factor that is fiercely ruling the arena nowadays are the tropical shades of orange which have everything going bright and citric. So, if you eager to know what inclinations are now the new talk of the town in the latest trend report, here’s an insight to the hottest color trend for spring and summer. This fiery hue is all the rage in every trend report of top spring and summer fashion show you’re going to find, so nail it and add it to your wardrobe. It is one of the color trends that seem to have scored greater popularity in the trend setters list this time with everything being served out classically in orange. Ranging from the sizzling vibrant hues of orange to the light tones, there is an ocean of color pallets of this exotic and refreshing shade which is your next seasonal look be it your block colored attire or your printed fashion dresses. 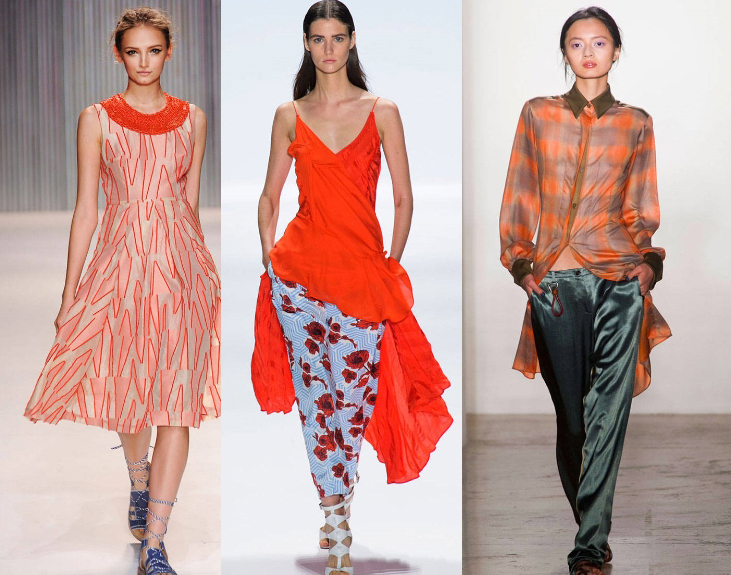 ORANGE PRINT FASHION – Mesmerizing the spectators with the initial catwalk, this energizing shade was indeed worth the sight with its strapless long slit gown followed on by unique collections of other printed orange attires for summer. Replete with invigorating freshness, there were short and long fashion outfits with creative sleeves, printed pants paired with contrasting/ matching shirt styles and rich metallic textures to make it all the more enticing for the onlookers. SHEER ORANGE SHIRTS– This was certainly one of the head turning fresh items on the runway and the most talked about style in the latest trend report of runways styles. Printed Net shirts showing body glimpses were ravishing looks of the models which are a treat for the bold and daring. It’s one of the best ways to relish the experience of the bold fashion looks. FIERY ACCESSORIES– They are the most thrilling and spicy touches of the trend report because of the indefinite – not to forget fabulous collections of fashion items that spice up your look with graceful designer handbags , shoes, jewelry, hair accessories etc that rendered blossoming effects to whatever look that was served out on the ramps. A real treat for the perfect summer look, this shade tends to be a charmer for all ages. ORANGE BLOCK COLOR DRESSES– If you’re in pursuit of stunning trends to spice up your semi formal and street style look, then you have gorgeous short and tea-length full block shaded dresses in orange with lovely designs to pair up with your fashion boots and a catchy short handbag dangling by the side. The instant sight of this lively shade will earn you a far off reason to be noticed. LIPSTICK -It’s not only the attires and accessories that have gone tropical but also the runway makeup trends. Being a part of the latest beauty trends for spring, orange color tends to rank now at the top for some dazzling impressions which require absolutely no other makeup touch to be noticed. Be it any colored silhouette, giving it a kissy touch of orange lipstick will suffice the criteria for a hot look. So, here was a trend update date one of the hottest colors in vogue with a massive variety of cool fashion styles and accessories update to let you have the best of what fashion is about these days.